Philosophical Investigations: Breaking the Universal Speed Limit? Breaking the Universal Speed Limit? Well, how do you measure the speed of light - and thus check that everything is observing this ‘universal speed limit’? Seven years ago, the closing months of 2011 saw much excitement in sciencey circles with the highly mediatized announcement that researchers at CERN, the world's most expensive physics laboratory, had detected sub-atomic particles apparently travelling faster than the speed of light. This, the papers assured us, was in defiance of Einstein and all the rules of relativity. Yet the plain ‘fact’ of the matter is that the speed of light is not magically ‘out there’ but merely a human convention. In a relativistic universe, how could it be otherwise? ‘In order to measure any one-way velocity, we essentially need two clocks: one at the start and one at the end. Obviously, the two clocks need to be synchronized and run at the same rate (and to be sure, they must not be moving relative to each other and also be at the same gravitational potential). Yet we reasonably assume that the two clocks run at the same rate, at least close enough for all practical purposes. Now we need to synchronize the two clocks to read the same at the same moment. How is this done? In his 1905 paper on Special Relativity, Einstein says: “We have not defined a common ‘time’ for A and B, for the latter cannot be defined at all unless we establish by definition that the ‘time’ required by light to travel from A to B equals the ‘time’ it requires to travel from B to A”. One can reasonably read Einstein's ‘by definition’ as ‘by convention’. Using Einstein’s convention to set the distant clock at a known distance, call it ‘D’, in empty space, we send a light signal at (say) time zero and when the distant clock detects the signal, it sets its time to D/c sec (the light travel time), where c is the standard speed of light in vacuum. Now we can measure the speed of any object moving between the two clocks. We can also use the two clocks to measure the one-way speed of light, but we are obviously guaranteed to always get c. In this sense, we get the speed of any object only relative to c and not absolutely. In this way, the one-way speed of light is a convention, depending on the convention for clock synchronization." Burt concludes by observing that there is a general belief system prevailing in physics that ‘whatever is known exists and rest is non-existent’. It is because of this belief system that scientists tend to fill these existence-nonexistence gaps by cofficients. Yet there can be much more existent and important entities quite apart from the usual quantitites of space and time which physicist are led to ignore. This attitude is the reason that the existence of Dark Matter was unimaginable for four hundred years. As to the spped of light itslef, Burt says explicitly that he cannot understand why Einstein established a ‘religion of special abilities and qualities’ for light. Specifcally, he objects tha even though there are ways to measure the speed of light, there is no reason to believe that nothing can travel faster. Our own correspondent, Muneeb Faiq, took up the issue for Pi too. Here he offers a thought experiment which again shows the arbitariness of the ‘speed of light’. ‘In fact, there is a lot of confusion about the harmony between the classical and quantum definitions of speed.If both quantum speed and classical speed mean the same then a very interesting difficulty comes to the front. Suppose there exists only one body in the universe. Just a single point mass and space. Is it at rest or in motion? If, however, there come out two photons of light moving parallel to each other. What speed are they moving at? If an observor is stationed on the point mass, then both the photons are moving with the velocity of light. Suppose, all of a sudden, the point mass ceases to exist. Now there are two photons moving with same speed parallel to each other. Nothing else exists except space. 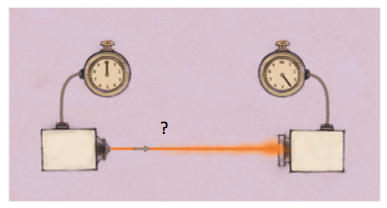 Are these two photons moving now because they are at same position in relation to each other which will be defined as the state of rest. The clever thought experiment that closes out this essay prompts additional speculation, to further mull over the theme here of a ‘universal speed limit’. The experiment starts by posing the notion that ‘there exists only one body in the universe. A single point mass and space’. Yet, a little later, the experiment refers to an ‘observer stationed on the point mass’. Might, therefore, one regard that observer as a second ‘body in the universe’ — that is, the observer as physical entity, in addition to the point mass as physical entity? Would the answer to that question in any way matter to what’s being posited by the experiment? The thought experiment introduces another twist by imagining that eventually ‘the point mass ceases to exist’. So, by extension, does the observer, previously ‘stationed on the [now-nonexistent] point mass’, cease to exist, too? (Which may reasonably be construed by the follow-on comment that ‘Nothing else exists but space’.) Or does the erstwhile observer exist elsewhere in the universe, and is still doing her job of observing? If, as implied, there is now no observer to observe — or, more particularly, to measure (in a quantum-mechanical sense) — the two photons in question, does that absence of an observer somehow influence both the reality and the velocity (‘universal speed limit’) of the photons? A good thought experiment invites people to think more about the what, why, when, and how that the experiment is getting at. This one appropriately does that, by drawing the reader in.